How does The Rodger Wireless Remote Bedwetting Alarm Work? How will my Child stop Bed-wetting? That is your concern as a parent. A difficult question. Not only for you, because for a long time expert doctors and scientists have been searching for the right solutions. Fortunately Rodger has found an answer to that question : The Rodger Wireless Bedwetting Alarm System, also for use by the hearing impaired with the use of a vibrating alert cushion. Easy to use and as like normal underwear as possible - They are cotton and can be Machine Washed & Tumble Dried - this is the Rodger Wireless Bed Wetting Alarm System. IMPORTANT NOTE: the sensor (in this case the pants) is the key to beating bedwetting. Don't be fooled by cheap but poor quality tiny sensors or domes. There are two press-studs on the underpants. You attach the small transmitter to these press-studs, after which your child can go to bed as usual. The transmitter is so small that it does not trouble your child during their sleep. There are NO cords in which your child can become entangled. You then place the receiver unit in the bedroom with your child. 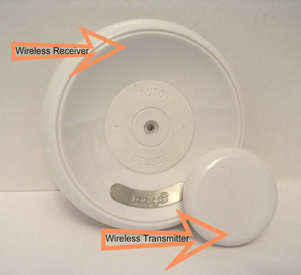 When your child wets a few drops, they will be woken up by the sound of the Rodger wireless bed wetting alarm system. This way your child will learn to recognise the signal of a full bladder and will get up and go to the toilet of their own accord in a matter of weeks. The system has 8 different alarm tones available, so you can either choose 1 particular sound or leave it and it will alarm randomly through the 8 possibilities, according to your personal requirements. Will My Child Ever Get Dry? Do you wonder whether the wireless enuresis system can rid your child of bedwetting? Frequently after a few days, progress will occur and usually after just a matter of weeks the problem will be solved. Motivation and perseverance are the key combination, both for the parents and the child. By using the Rodger Wireless bed-wetting alarm system, you & your Child can experience what it is like for your Child to wake up dry. LESS LAUNDRY... and the expense that goes with it!! !